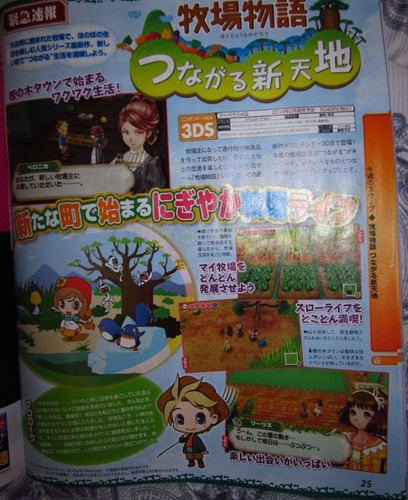 The October 24 issue of Enterbrain's Weekly Famitsu magazine is revealing on Thursday that the newest entry in Marvelous AQL's Bokujō Monogatari (Harvest Moon) farming simulation video games will be released in February for the Nintendo 3DS portable console in Japan. The new game titled Bokujō Monogatari: Tsunagaru Shin Tenchi (Ranch Story: Connecting New Worlds) will retail in Japanese stores for the price of 5,040 yen (about US$51). The player will be able to play as either a female or male character, and new villager characters include a girl named Lilie and a woman named Veronica. Fieldwork has been improved to make the process simpler, but the basic mechanics remain the same as in the previous game's. In addition, as the story progresses, players will be able to take care of various animals by going on a “safari,” and will be able to trade their produce and other products with other countries using the Trading Post. As the player's popularity increases, his or her products can be shipped to more countries using the Trading Post. In the safari, the player is able to interact with wild animals, and the game has approximately two times more animal varieties than the previous 3DS game. It is also possible for the player to play a minigame that allows them to play in the river and catch fish. The previous game in the franchise, Bokujō Monogatari: Hajimari no Daichi (Ranch Story: The Great Earth of Beginnings), was released in Japan in February 2012 for the Nintendo 3DS, and Natsume released the game in North America and Europe under the title Harvest Moon: A New Beginning later that year.